File an original copy of the separation agreement with the local recording office designated by the laws of your state. Make certain the separation agreement has been signed in front of a notary by both parties, and that the signatures are originals. The copy of the agreement that is filed must be the original, or a copy with original signatures. State law specifies where the agreement must be file, but in most states it is the county clerk in the county in which at least one of the parties resides. Couples who do not want to file their entire separation agreement may, where permitted by state law, prepare a memorandum of separation, and file it in place of the full agreement. 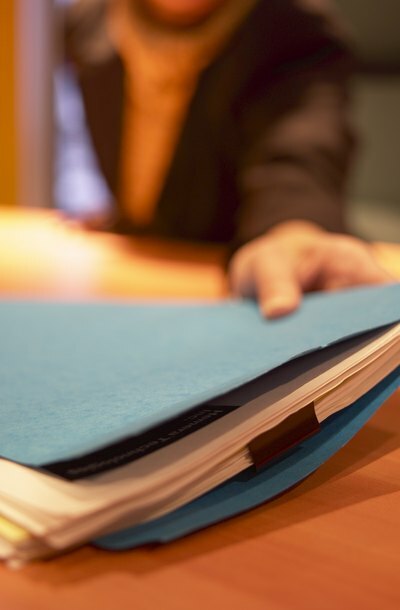 Divorce and separation documents are generally treated as private by local recording offices, and are not available for viewing except by the parties to the agreement or their attorneys; however, some people prefer not to have the information in a separation agreement on file until they decide to file for a divorce. A memorandum of separation is a single page containing only the names of the parties, the date the separation agreement was signed, and the names of the attorneys, if any, for the parties. The memorandum must be signed by both parties in the same manner as a separation agreement. Get a certified copy of the separation agreement or memorandum of separation from the office in which it was filed. The county recording office retains the original separation agreement or memorandum of separation that has been filed, but for a fee it will certify a copy as a duplicate of the original that is on file. This "certified" copy can be used in the same manner as the original. Put the certified copy of the filed separation agreement or memorandum of separation in a safe place. If you live in a state that recognizes living apart under the terms of a separation agreement as a ground for filing for a divorce, the certified copy of the separation agreement or memorandum of agreement is a part of the paperwork filed with the court to commence the divorce action. The certified document, whether it be the agreement or the memorandum, is proof of the existence of a separation agreement and of the date it was filed.